Several soundbites can be heard. BATTLE BREAKS is the only BEMANI song composed by DJ TAKAWO that doesn't appear on the MADE IN JAPAN album. It is also DJ TAKAWO's only appearance in the DanceDanceRevolution series. BATTLE BREAKS received new Single DIFFICULT and EXPERT charts in DDR FESTIVAL -DanceDanceRevolution-, replacing its old ones (however, these charts are only used in DDR FESTIVAL). BATTLE BREAKS received BEGINNER charts in DanceDanceRevolution ULTRAMIX2. BATTLE BREAKS appeared on mock-up screenshots of DanceDanceRevolution SuperNOVA. However, it has never been on an arcade DanceDanceRevolution title. 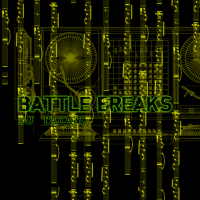 BATTLE BREAKS received an updated background in DanceDanceRevolution ULTRAMIX4. BATTLE BREAKS received new graphics in DanceDanceRevolution UNIVERSE2. beatmania (2006) difficulty rated from 1 to 10. This page was last edited on 2 January 2019, at 18:34.